Are you happy with the course feedback process in your classes? I wasn’t and set out to improve it this year. Fall 2013, I wanted to speak the kids’ language. Yeah, that didn’t go over so well. Also, the feedback was mostly useless, too. Fall 2014, I tweaked the questions but kept the same general feedback (except for the questionable slang usage). We shuffled the sticky notes around the room and I asked for a volunteer to start us talking by reading the comment in her hand. We talked, for example, about the problem of off days. Kids added their own thoughts to the original note. I think we discussed my one prompt and their thoughts for about 20 minutes. Every class got a different prompt. Keeping all the kids engaged in the discussion was tough. I’d guess that about 75% of each class wanted to join the conversation. The rest played on their computers or phones, which didn’t bother me too much. I’m definitely doing this again. One thing I’d do different is implement this at midterm so that the kids giving the feedback might benefit from it. ← Why Am I So Gay? Good on you for sticking your neck out there. Don’t you want to hear all of your students answers to all of your questions? 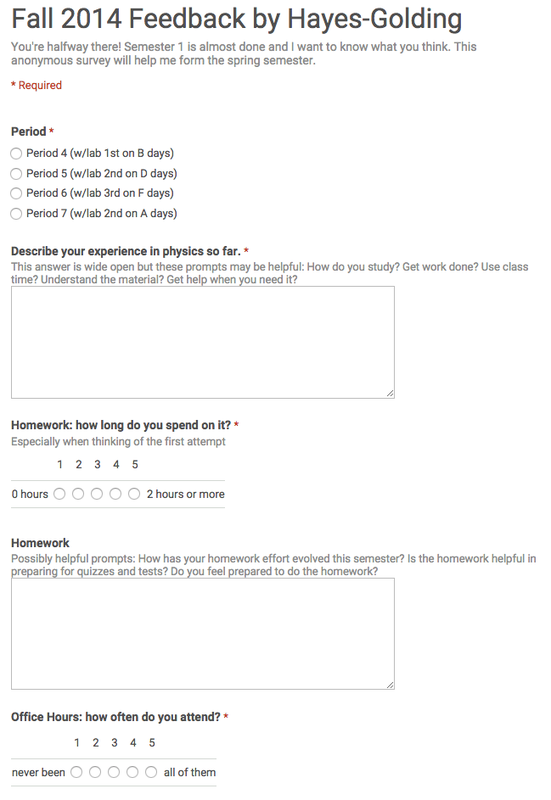 I like your idea but I would hate missing some students thoughts. What are your favorite or most helpful questions to ask? I originally wanted to hear every kid’s thoughts on every prompt, which is why I stuck with a traditional feedback method so long. I suppose I’ve made a conscious decision to shoot for depth over breadth with each kid. I definitely get your point, though. Since I’m in the midst of it, I might share all the prompts with all the kids and invite them to email me additional feedback. Thanks Megan. Sent this post to my department! I suggested to a new teacher to put have students place stickies against Green, Yellow, and Red backgrounds, exit ticket fashion if he wasn’t going to do the discussion piece. I am sure the discussion was rich. and I I concur with JStevens, good on you for sticking your neck out there!